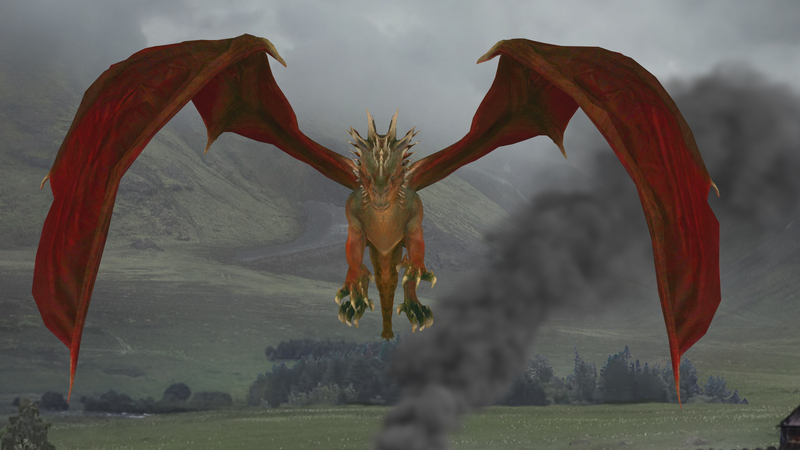 New Science Channel series, "Mythical Beasts," debuts with the dark origins of dragons – AiPT! Regular readers of AiPT! Science know that we love creature myths and folklore. Monsters are a lot of fun from skeptical point of view, but that’s not to say they aren’t frustrating in their own special way. When the word came out that the Science Channel was home to a new eight-episode series, Mythical Beasts, it evoked an awkward feeling of slight concern and tepid excitement. Shows about myths and unknowns have been done time and again on various networks, but they always seem to leave the viewer with nothing except empty promises. In true form, I wanted to believe the myth that a good, quality show about mythical creatures could exist. The premiere episode of Mythical Beasts, debuting tonight, explores the origin of dragons and how they became such popular icons. That’s no cow, that’s a DRAGON! In terms of logical reasoning, “not a cow” is a totally valid conclusion, but why would medieval people jump straight to “dragon”? Today we know that dinosaurs roamed the planet millions of years ago, but it doesn’t really occur to us what a person in 1428 would have thought when stumbling upon a huge bone. According to Pabst, you do the same thing today as they would have then: make the best guess you can with what information you have available. The journey to answer the “why” question is a wild one that involves religion, high illiteracy, fear-mongering, and the basic human desire to have an explanation for the unknown. The expert panel of mythologists, historians, archaeologists (and even one Egyptologist) do a fabulous job of taking us back to a time when modern technology didn’t exist and people relied on the clergy and stories from others to make sense of the natural world, including the fossils they’d occasionally find. Mythical Beasts also shares medieval biblical manuscripts, artwork, sculptures, and epic sagas to provide a great starting point for the origin of dragons. We don’t need modern science to understand the origin of dragons, but to understand how and why the existence of dragons was used as a rational explanation for the world around them is best done through a scientific lens. Medieval people of Lucerne were fearful that fire-breathing dragons caused storms from Mt. Pilatus, but meteorologists explain how the mountain itself lifts warm, moist air, allowing for violent storms and floods below. Those living in Lucerne during the middle ages had no idea how storms formed, or why they were so brutal to their town, so they attempted to understand it the best they could, with the knowledge they had. As science advanced,, the people began to understand their surroundings better, and dragons seemed less likely to be the culprit. This scientific understanding, according to Mythical Beasts, is also how we let go of myths and move forward. A story’s told of a dragon dropping a stone that could cure disease, but x-ray fluorescence shows it’s nothing more than clay formed around iron, copper, and nickel (likely an early hoax by the farmer who found it, for whatever purpose). Dragons’ blood was believed to have healing properties, but analysis proves it was just sap from trees on the Canary Islands. Suddenly, dragons aren’t really so scary, and relics like the serpent stone and dragons’ blood begin to lose meaning. Medical science takes hold, just like meteorology, and ideas of dragons are left behind. According to the experts, this knowledge is explicitly what killed the dragon, but also what keeps them alive. Despite knowing dragons aren’t real, they are a way to face our fears collectively or independently. We all have the need to fight and slay our own dragons. medieval dragons, and the dragons from China. It’s obvious at this point in the show that medieval dragons are cruel, evil creatures. Chinese dragons are the complete opposite; revered and held as benevolent, magical creatures that fly without wings and bring rain to crops. A quick breakdown of the symbolism of the Chinese dragon is provided, with a brief look at two artifacts. While it’s refreshing to see the addition of this gentle giant, it feels like there isn’t enough information or time devoted to it. It’s mildly distracting, because in the context of the show’s premise it makes logistic sense to move through it briskly; we are talking about scary beasts, not benevolent ones. The one truly puzzling point of Mythical Beasts is when mythologist Richard Schwab states that finding fossils in China “might have inspired their dragon myths completely independent from Europe.” This creates so many questions and then leaves them unanswered. It would be interesting to explore that a bit further and find out. (Move over Harry Potter universe. I’m not even sorry for that reference.) This show really has it all! Even the CGI was well done. Mythical Beasts not only slayed all my viewing fears, it restored my faith in the myth that a creature show can be done properly. Future episodes will include busting open the myths of vampires, minotaurs, and cyclops, each promising to bring fact-finding, scientific research straight to your home. I really enjoyed this show and I can’t wait for more. Starting tonight, you can catch Mythical Beasts on Sunday nights at 10:00 pm eastern time, on the Science Channel.